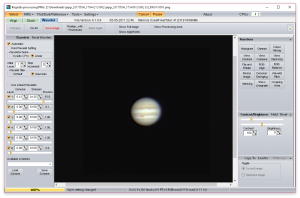 Jupiter on the night of 3 May 2017, just before 9 p.m.
It’s been over a year since I wrote my first post in this series, Beginning Astrophotography: Jupiter Ascending. 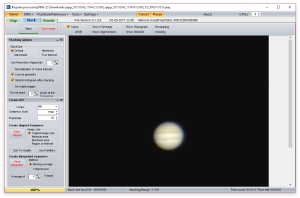 I’ve learned a great deal about what’s possible with the equipment I have on hand and what it takes to acquire a photograph like the one I took of Jupiter this May, with which I’ve begun this post. It represents both a rare night of luck but also a couple of years of practice and reading. This post is going to be a long one, with lots of sections, each describing a piece of my journey toward grabbing that photo. In my previous posts, I’ve withheld a lot of detail in order to focus on my personal story. My audience has consisted of my friends with whom I want to share my enthusiasm, whether or not they care about the practicalities. Now I want to circle back and fill in those gaps. In this post, along with the story, I’m intentionally targeting an audience interested in the marrow of astrophotography, with its attendant detail. 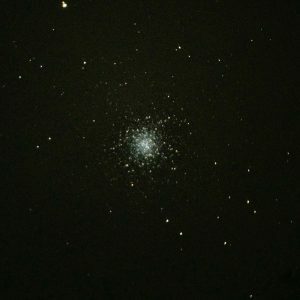 I am an amateur, pursuing astronomy as a hobby in my free time, as I have done for less than two years now. What I describe below, I hope, lies within the reach of motivated hobbyists who may be fortunate enough to find themselves with the time, money, and circumstances to support the pursuit for themselves. I have also written a separate post answering questions I frequently get when I share photos like these. 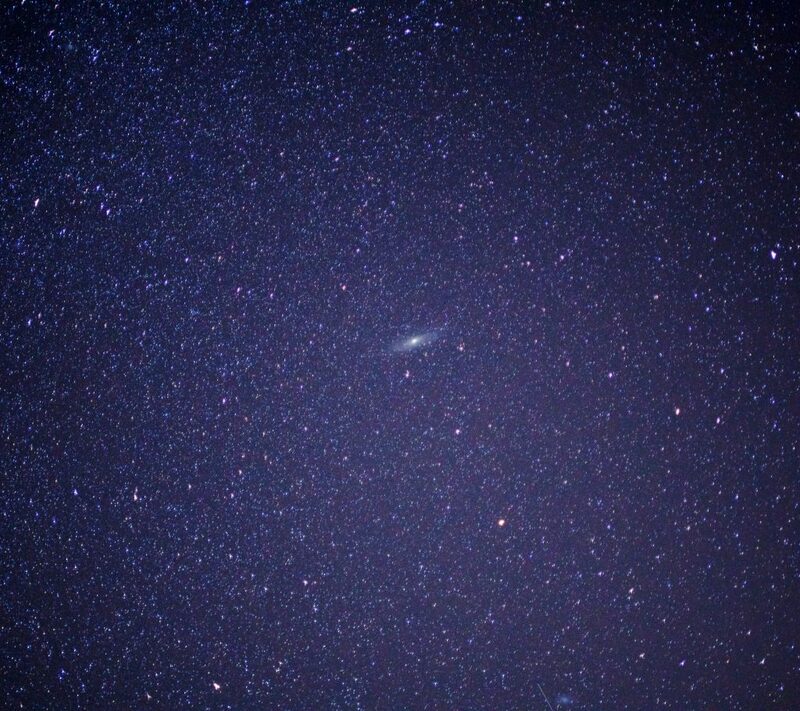 If you’ve become curious about this hobby for yourself, it may help you set expectations about what amateur astrophotography involves. In my earlier post, I discussed equipment choice a bit. Now I want to talk more about why I have the equipment I have, what its capabilities are, and what its limits are. When I think of hobbies, I think of, say, knitting, drawing, fishing, hiking, or building things out of matchsticks. Each of these hobbies lets you start off with a handful of dollars, a few odds and ends lying around the house, or a castoff from a friend. What you get out of each depends a great deal on the effort and practice you put in up front. If you want to spend hundreds or thousands later on, that’s fine, but your results won’t commensurately improve without that effort first. Then, I’ve found there’s a whole world of hobbies that are rather pay-to-play—photography, for example. You save up for that first camera, and maybe it comes with a lens, but gosh, the result leaves something to be desired. You need another lens. But this one won’t zoom in! Before you know it, you’re a handful of lenses deep and realize that you need a camera bag. Now you’re realizing your new camera takes photos faster than the SD card can save them, so you need a new one of those, and you might as well have a spare. And so on. Astronomy as a hobby can go this way. 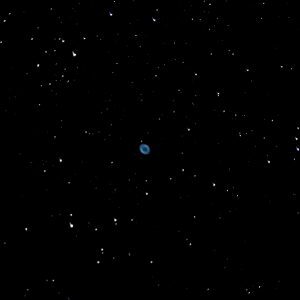 Once you’ve got an entry-level telescope, you might be set, but then you might begin to see its shortcomings. Last year, I found myself at this point, considering my first upgrades. I feel extremely lucky that, at this point in my life, I can indulge in one of these pay-to-play hobbies. Combining photography with astronomy just multiplies the effect. I began with a really modest budget, and then I leapt in with both feet. The first budget I set for myself was about $300, but I ended up stretching to about $400. I chose a budget small enough that if I had a bad experience, I could eat the cost without too much pain. If I had it to do again, I might have set a budget closer to $200, and I would have come out of the experience just as informed and enriched. I had had no intention of doing any photography yet because I had literally no idea it was possible, what equipment was necessary, or how hard it would be. I figured it was out of reach, so I ignored it as a consideration. With astrophotography out of the picture, I only considered what would give me the best view for my dollar. I began trying to search for how magnification worked until I learned that magnification was practically limited by other factors, like eyepiece choice, focal length, and aperture. In fact, the more I read, the more aperture stood out as the one most salient attribute of a telescope’s viewing ability. I also explored a maze of other features, like fancy, computerized controls and such, but I found those dug significantly into the price. When telescopes in my price range included fancy features, they also invariably had smaller apertures. So I had to trade off between fancy features and sheer viewing power. I decided to prioritize for aperture. I didn’t know what I’d be looking at, so I thought having as much aperture as I could afford would accommodate the most situations. And I thought the fancy features would be intimidating and hinder me from learning the mechanics of using a telescope. I ended up buying an eight-inch reflector. It cost me $380. Reflectors use an extremely simple design—I was paying for little more than a metal tube and a couple of mirrors. If I had known I’d be primarily looking at bright targets (moon and planets), I might have made a different choice and not prioritized aperture as much. In fact, the telescope I got was right at the edge of what I could carry in my car or by hand. When it arrived, I took it out that very night and saw Saturn. I had tried to take a picture of Saturn that first night, but I didn’t get anything recognizable. It didn’t take long for me to decide both that, yes, I definitely wanted to pursue this hobby further, and I definitely wanted to share it with others who couldn’t be there with me. As I’ve mentioned, I feel I’ve had a lot of personal luck in being able to set a much larger budget for my second telescope. I believe that I budgeted around $3,000, but in the end, I’ve probably invested, all told, $4,500 in it and accessories. Not all of that has been spent at once, though. In fact, again, some of it was possibly overspent since I didn’t know exactly what I needed. In fact, I felt comfortable with a larger budget because I had decided I was investing for the longer term—I do not intend to buy another telescope for a very long time, if ever again. So I thought of this as my “lifetime” telescope. In buying the second telescope, I wanted a more compact tube (in length), mistakenly thinking it would mean a lighter overall telescope. I was dreadfully wrong—the current telescope altogether weighs something like a hundred pounds assembled. I also thought it would be more portable, but again, I was wrong—a more complicated setup has led to many more (heavy) pieces to set up and break down each time I want to use it. I continued to focus on aperture (forgive the pun), but I also wanted computerized tracking, a hard requirement for more serious astrophotography. Computerized tracking lets the telescope follow an object in the sky as it moves—as the Earth moves—so that the object doesn’t slide out of view or move around. 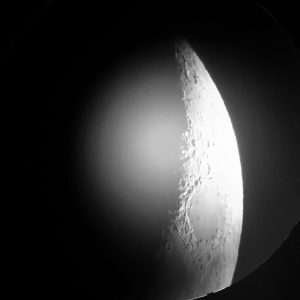 In my budget, my requirements meant buying a Schmidt–Cassegrain telescope kit, including a computerized mount. A Schmidt–Cassegrain telescope (SCT) is a kind of compact reflector telescope combined with a special lens, called a corrector plate. I was daunted by the prospect of learning to put it together and break it back down—each time I wanted to use it. I was daunted by the prospect of figuring out how to align it to the sky—each time I so much as moved it a few inches. 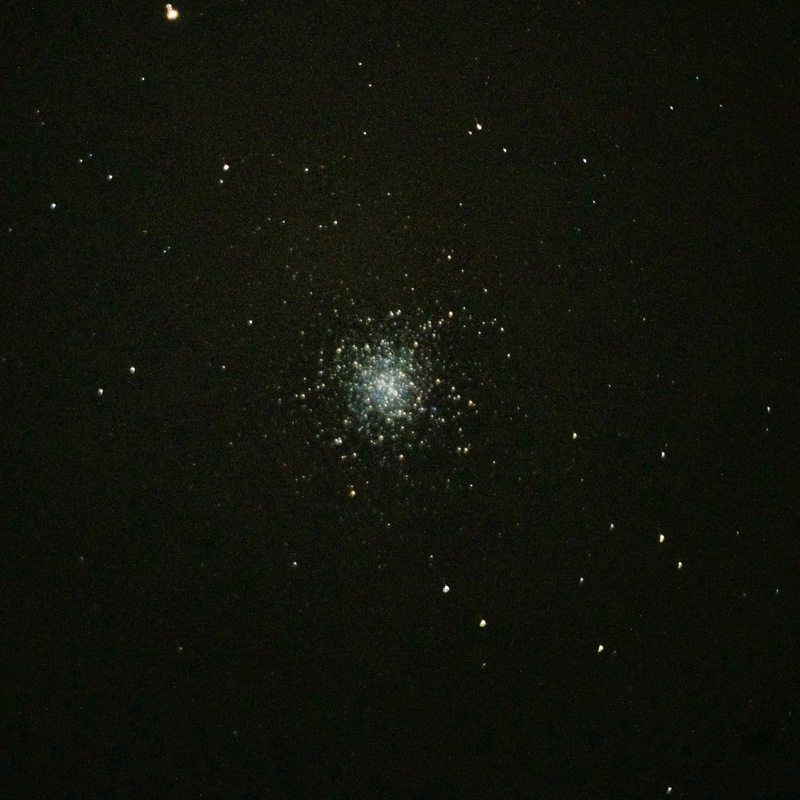 I’ve gotten better at these things over time, and they’re not so bad, but if I had begun with this telescope, I might have literally cried and given up at some point. Learning to use it has been, in itself, a journey for another time. I already owned a camera for taking photos, and I needed to figure out how to connect this thing, somehow, to the telescope. It turns out that adapters exist that lock onto the camera body like a lens would, while the other end is shaped like an eyepiece that goes into the telescope. They do nothing more particularly special than hold the camera’s sensor at a fixed position and distance from the telescope’s back opening (or an eyepiece, if one’s in there). From there, you focus the telescope’s light onto the sensor, and the entire telescope functions as one giant lens for your camera. The adapters are usually pretty (relatively) inexpensive. One I’ve used recently is on Amazon, and an earlier adapter kit costs the same. 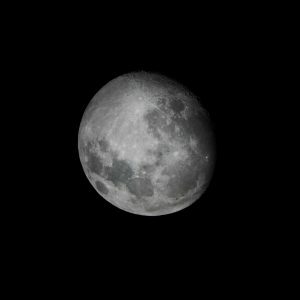 As I mentioned in my FAQ, it’s even possible with some practice simply to hold any camera up (with a lens) to the eyepiece of a telescope, focus, and take a photo. This works, even with a smartphone. There exist adapters to help with this. My camera is a Sony α6300 with an APS-C CMOS sensor. It’s a mirrorless camera, making it like a smaller version of a DSLR camera. I chose it for more general photography, but it works decently for astrophotography because it’s light and takes 4K-quality video. Once my telescope was assembled and ready to use for the first time, Jupiter provided the first target of opportunity from my house. The first challenge I had was focusing on Jupiter properly. I live in the Pacific Northwest, where conditions usually aren’t conductive to astronomical observation in the first place. Even when the sky clears, that isn’t the end of the story. For planetary viewing, astronomical seeing plays a huge role. Without good seeing, Jupiter’s disc appears to smear and soften randomly, no matter what I do or how hard I try to focus. Magnifying more closely doesn’t matter; it doesn’t help. Below, I’ve added a small video clip of what Jupiter looks like under relatively poor seeing. It wobbles, shimmers, and smears. Seeing changes from moment to moment, so maybe if you’re patient, the seeing will clear for a moment on a given night, and you can take good photos or video. The problem is, without good conditions to start with, it’s tough to know if you’ve focused properly in the first place. Another problem is that observing Jupiter actually requires some study and practice, to become accustomed to its appearance through the telescope: how it should look when it’s perfectly in focus, what distortions come from bad seeing, and what distortions come from bad focus. Last year, I used a lot of trial and error. I found that each night I got a little better, saw a little more detail. Where first I saw a mottled disc, I wondered later, were those cloud bands? Was that the spot? Is that how it really looks, pale and pink, instead of blood red like I’ve seen on TV? I learned to use the moons, which appear to be much smaller and nearly points, to improve my focus. I also tried using a device called a Bahtinov mask, which is a simple piece of plastic with slots that goes over the end of the telescope. Its job is to distort point sources of light in a specific way such that, when something’s slightly out of focus, it’s more obvious. See the two examples below. The first is slightly out of focus, while the second is perfectly in focus. Both photos look almost identical, but look closely. The diffraction spikes (the lines of light) don’t quite meet in the center in the first image. In the second one, they do. The smaller star off to the left looks a bit softer in the first photo, while it looks sharper in the second. The difference is subtle, but it makes a world of difference—literally. Since the whole sky is at the same focal distance, I can use the Bahtinov mask to improve my focus on a small point source of light, and then I can home in on Jupiter. Since I know it’s precisely focused at that point, I know any additional distortion is due to other factors, such as the atmosphere. Now, assuming that I have a night of clear conditions and decent seeing, I’m still limited in the detail I can observe in any instant. 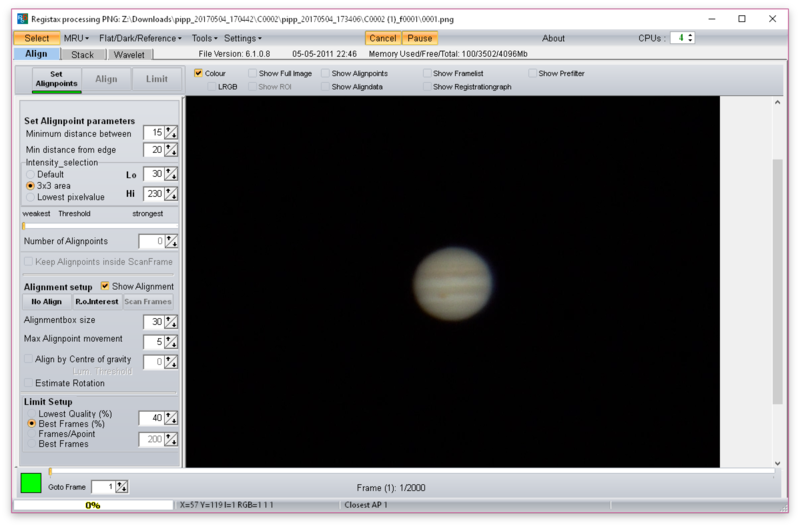 At right, I’ve added an image of an individual frame from a video of Jupiter I took the night of 3 May 2017. It has not been altered in any way, except that it’s been cropped and rotated. The exposure length was (if I recall correctly) one eightieth of a second. It was chosen from among thousands as representing one of the very best possible frames I took. The Great Red Spot is clearly visible in the lower left quadrant. There are distinguishable cloud bands, but their finer details are not present; they appear to be even, smeared stripes across the surface. This is as far as I’ve ever gotten with an individual photo. I have literally hundreds of similar photos, all taken under slightly different circumstances and with slightly different methods, but they all end up looking roughly like that one. More detail eludes me, at least on a sensor. I know I can buy yet more stuff and get more detail. It’s out there. I’m only a couple of years into my hobby here, and I haven’t explored CCD sensors or apochromatic refractors, and I’ve barely begun to learn to get all the detail I can from the photos I have taken. But this is the place I’m stuck at now. So, if computers didn’t exist? The story would end here. But again, I count myself lucky. Computers have brought lucky imaging within the reach of amateurs like me. Specifically, I’ve been practicing a technique called image stacking. The idea is that, with some software I can find online, I can take lots of individual photos and combine them into a single better photo. That’s how I created the photo of Jupiter at the top of this post, along with the one below. Instead of just taking hundreds and hundreds of photos, my feeling is, it’s easier just to take a video over several minutes. Here’s where the benefit of 4K video really comes into play. By taking a video over several minutes, also, I increase the odds of encountering a few moments of exceptional seeing. I can even fool around with the focus during the video, sacrificing some frames as “first pancakes” while I get things right. The software later can identify the best frames and use those. The software I’ve found online so far is pretty daunting, confusing, and flaky. Most of it only works in Windows. I’ll describe here what I do, but I strongly encourage you to find what works for you because I am pretty sure I am doing something wrong or sub-optimally. I only hit upon this workflow after trying many, many different things over several nights and weekends, until the end result was somewhat presentable. 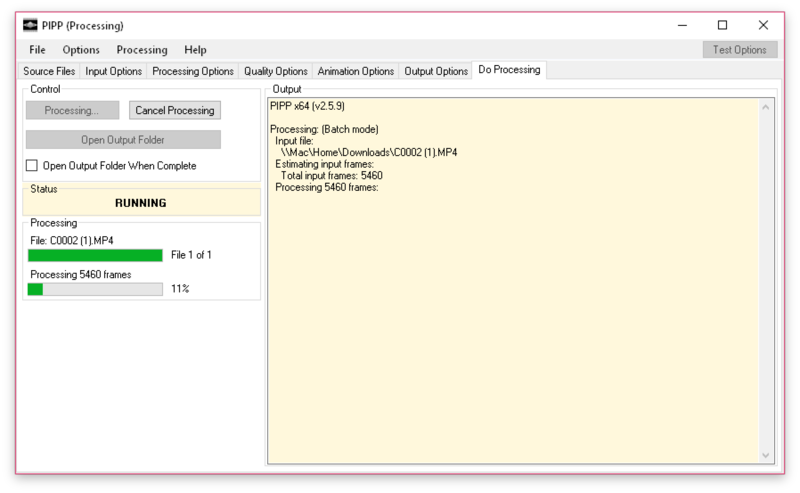 The first thing I do is take the video file I’ve imported off my camera after observing and load it into a piece of software I found called PIPP. Its job is to take the video, crop it down, rotate it, find the best frames, extract those, put them in order, and output them. It took a lot of trial and error to get some output that worked, and I’m still not sure I’ve done it right. Problem is that with a video of any size, it takes most of an hour to do its job, so I usually make my best guess and look at what it outputs to see if it’s reasonable. From a video of several thousand frames, I usually cull off about 1,200 of the best frames (as PIPP determines them). Once those 1,200 frames are sitting in a folder, I’ve been using a piece of software called RegiStax to turn them into a single detailed image. 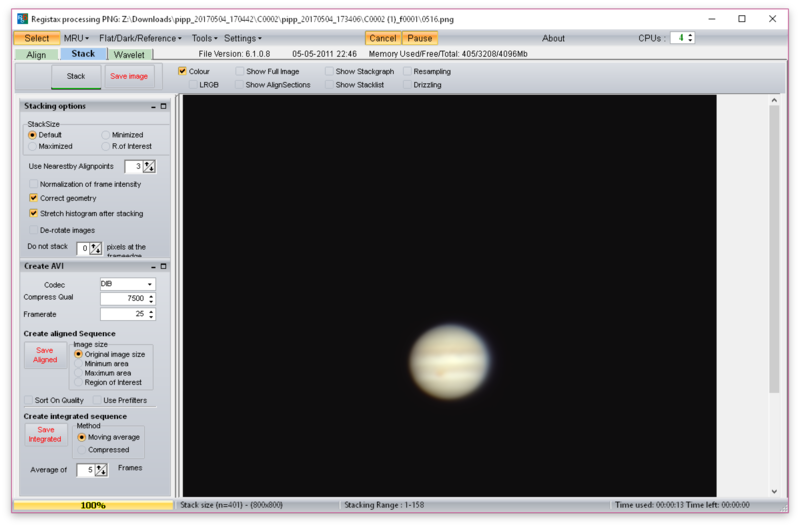 I’ve added some screenshots above of RegiStax, as I’ve used it to prepare an image of Jupiter from frames similar to the one I included above. My experience of using this software is that it’s extremely confusing and took many hours of practice to get to work. Making things worse is the fact that any misstep would cause the software to misbehave or outright crash, so I became accustomed to simply closing and reopening RegiStax—and starting from scratch—anytime I did something wrong. Finally, compounding the whole unpleasantness, I couldn’t see whether my result would turn out worthwhile until the very end when I began applying wavelet filters. I found myself flying blind, from beginning to end, until a planet popped out, usually wasting an hour each time. As near as I can tell, though, here’s roughly the process from RegiStax, though. Hit “Select” in the upper left and open up all the images to stack at once. First, hit the “Set alignpoints” button. (I found that I had to tweak the alignpoint parameters to allow a few more alignpoints. It took me hours to figure this out.) This happens quickly and automatically. Then click “Align”. This takes a moment. Finally, hit “Limit”. I found through trial and error that a smaller limit was better in my case, likely because my photos were somewhat less detailed. I ended up limiting down to something like 20% to 40% of frames. At this point, the software automatically moves you over to the “Stack” tab. I mostly left what I saw alone and hit the “Stack” button. This takes a moment. The image looks strangely blurry after this. Finally, I found myself at the “Wavelet” tab. I had no idea whatsoever what to do here, so I searched online for things to try. I’ll relate what worked for me (specifically, what I changed from the default). I used the dyadic instead of linear scheme. I used the Gaussian instead of the default filter. I believe I linked the wavelets, but I only dimly recall. The first wavelet filter I used aggressively, with denoise set to 0.11 and desharpen set to 0.125 or so. These values can be tweaked. Then I moved the slider to the left, and this is when I finally saw some detail emerge. The second wavelet filter I slid without changing any values. I tried adjusting the sixth filter very slightly, but its changes were extremely aggressive. The wavelet filters add some aggressive artifacts which I compensated for by clicking the button on the right called “Denoise/Deringing” and used some of its sliders slightly until the ring artifacts softened. Once all that was done, I saved the resulting image, the one I began this post with. I also tried this with a second video and had similar (but slightly less impressive) results. The original video was slightly differently taken, and some of the processing I used was also slightly different. Jupiter as it appeared on the night of 3 May 17, just before 9 p.m. 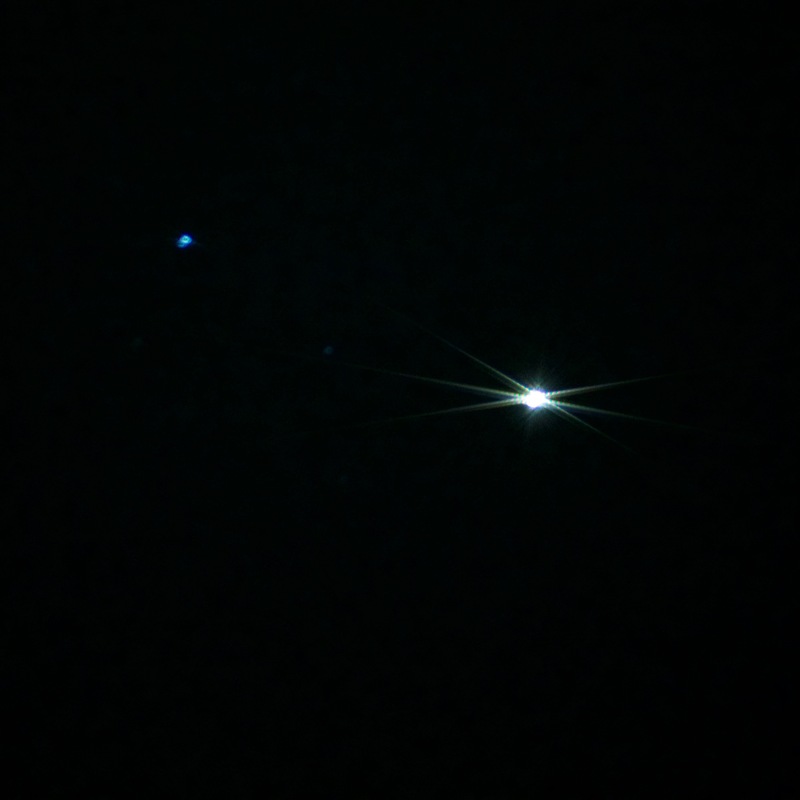 These photos represent the very best I’ve ever managed to take of any celestial object so far. Finer details are visible, such as some finer cloud bands, and a hint of the small white clouds between the Great Red Spot and its adjacent cloud band. 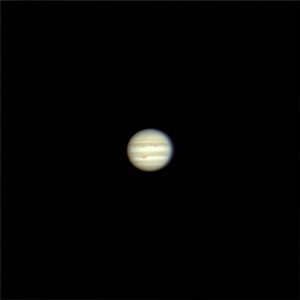 I’ve learned a lot along the way, and having done so, I can usually process a video of Jupiter in about an hour into something clearer. There’s a ton of room for improvement. RegiStax is literally just the first piece of software I managed to figure out enough to get any kind of result. There are probably better processes, better pieces of software. 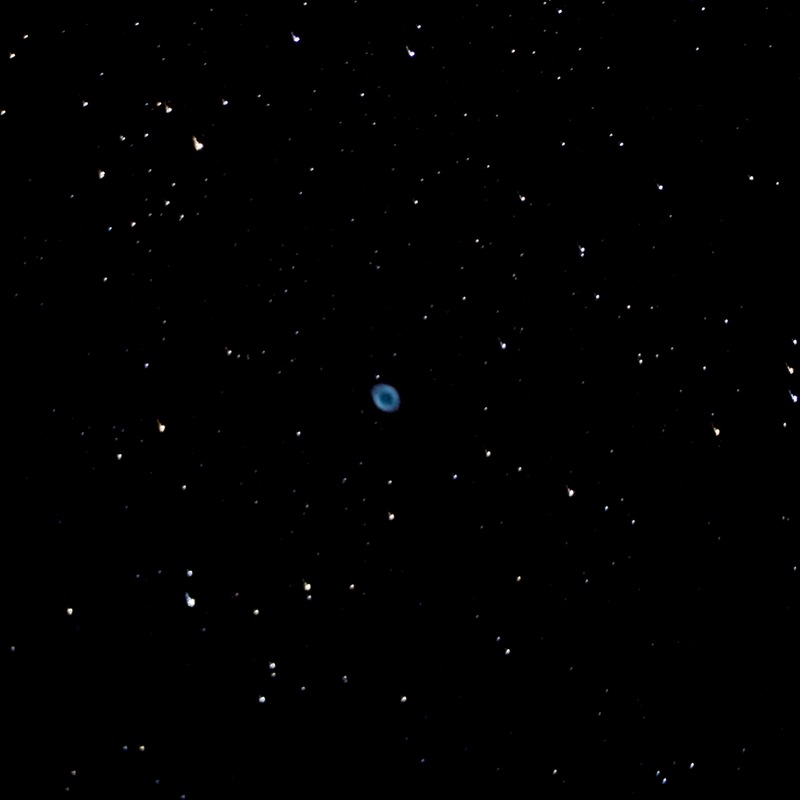 And there are definitely better pieces of hardware, better photographic and noise reduction techniques. I’ll update this post with clarifications and additional information as needed. Feel free to contact me (especially on Twitter) to let me know what I can improve. Thanks so much for reading about what has been a labor of love for me.